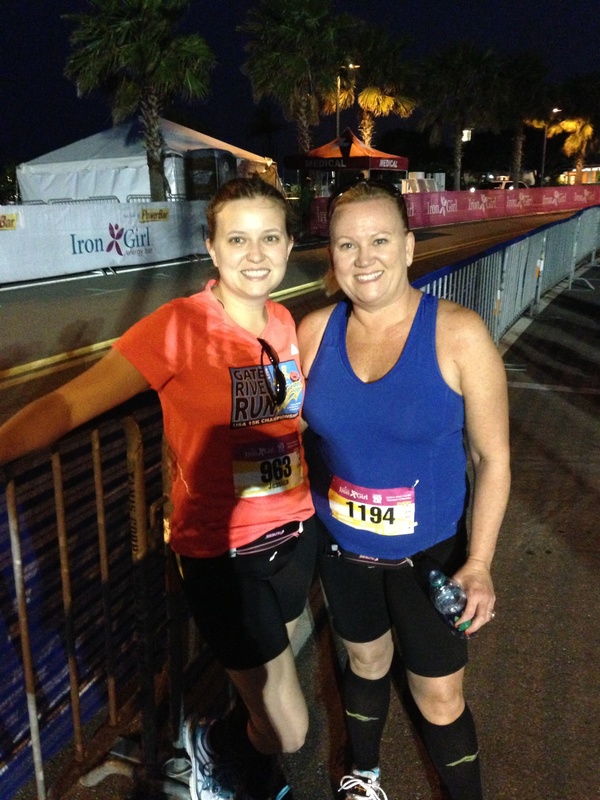 Mom and I before the race began! all my running – but I am so proud and blessed! Proud that I have completed more than I thought I could. Proud that I started running after considering myself a non-runner. Proud that I have lost weight and inches to feel better about my body after having a baby (it’s a different body, but I think I like it better!). Blessed that I haven’t had any major injuries during my training. Blessed to have a friend like Caitlyn that will answer all of my silly questions and that offers encouragement when I hit a rough spot in training. Blessed that I have been able to run two out of seven races with my husband. Blessed that I have been able to run four out of seven races with my mother. Blessed that I am physically capable of running and pushing myself to complete a half marathon with three months of training. 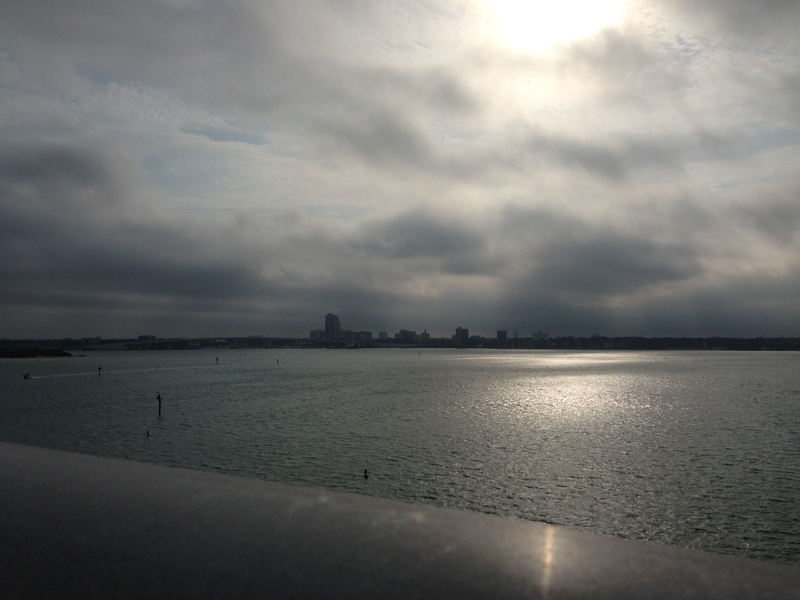 View from the top of the Sand Key Bridge! As always, these race mornings start early. We pulled into the parking lot and got a pretty good parking spot. Within about 15 minutes the parking lot that we parked in was full! Good timing! I was concerned about the start and wondered how they would spread the field out to not have a ton of congestion. They had pacers which did a fairly good job at giving you an idea how you would finish. My goal was to keep the 3 hour pacers in my sights! Up the second bridge on our way over to Sand Key! Overview of the course: Started Coachman Park in Clearwater. 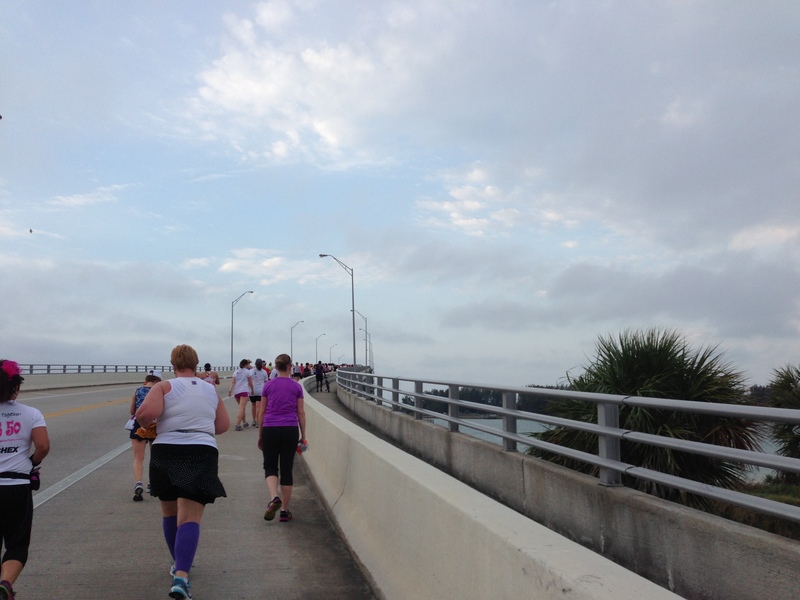 We ran from downtown Clearwater to the Beach, followed the beachfront to the Sand Key bridge. Over the bridge, through the Sand Key Park and down past the park about 2 miles. On the way back, it was basically the same without the detour through the Sand Key park. 13.1 miles that consisted of the two bridges pictured below. We ran each one twice – so technically that is four bridges! These were no small bridges either! They were rough! It was an overcast morning with a decent breeze. Although it was a little muggy, it was great weather for my first half! As I was coming into the Sand Key Park, I spotted Ashley Moody. Shortly after coming out of the park, I saw Caitlyn – she was on the way back from the turn around. After I turned around, I saw my mom on the way back. She was doing good! These little bursts of encouragement helped push me on! 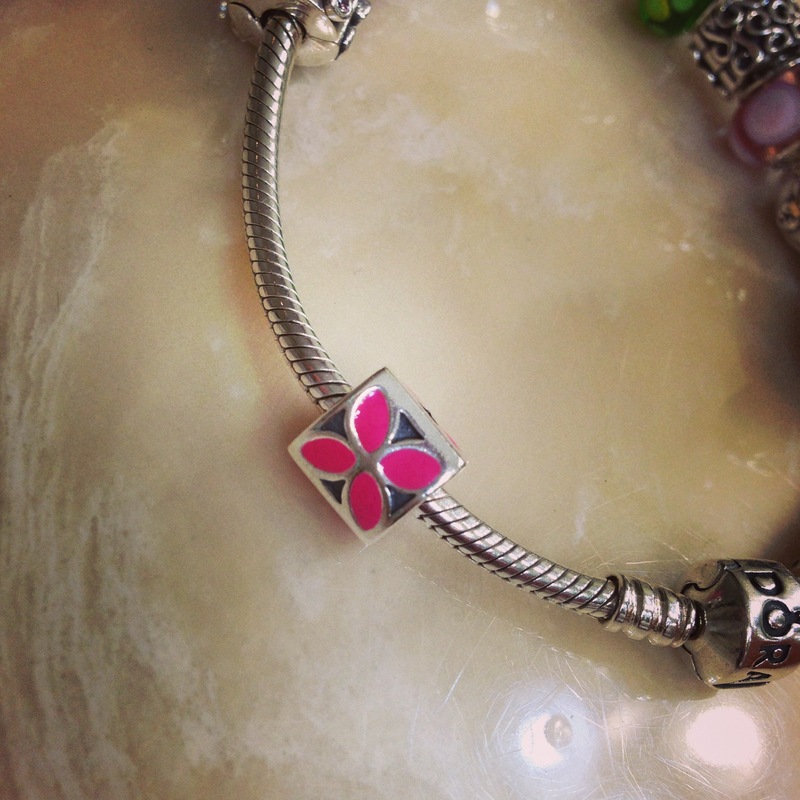 To celebrate finishing my first half, David got me this Pandora charm. It was the closest one to the Iron Girl logo! The entire race I was behind the 3 hour pacers. I thought I would finish just over 3 hours. As I rounded the last small turn and hit the 13 mile marker, I saw the 3 hour pacers. They had run too fast and had to stop so that they would cross at the right time! I was so pumped… I was going to finish in less than 3 hours! That was enough encouragement to push through the last .1 miles with more gusto than I had run the rest of the race! After finishing, I waited on my mom to finish and admired my medal! Even though she battled a muscle issue in one leg, she finished shortly after me. She did amazing! It was a good race, with plenty of water/Gatorade stops. There was even one water stop with girl scouts that handed our cookies at about mile 8 or 9. That was awesome! It was neat to run an all women race, although I did see a few men ghosting in support of their wives or mothers. I am totally ok with that! We are strong and capable, however support from loved ones is always welcomed! Just before I crossed the finish line, I saw Jenn Smith. She works at Fivay High with me and ran the 5K. She and her husband cheered me across the finish line. She got a sub-40 PR! So proud of her! 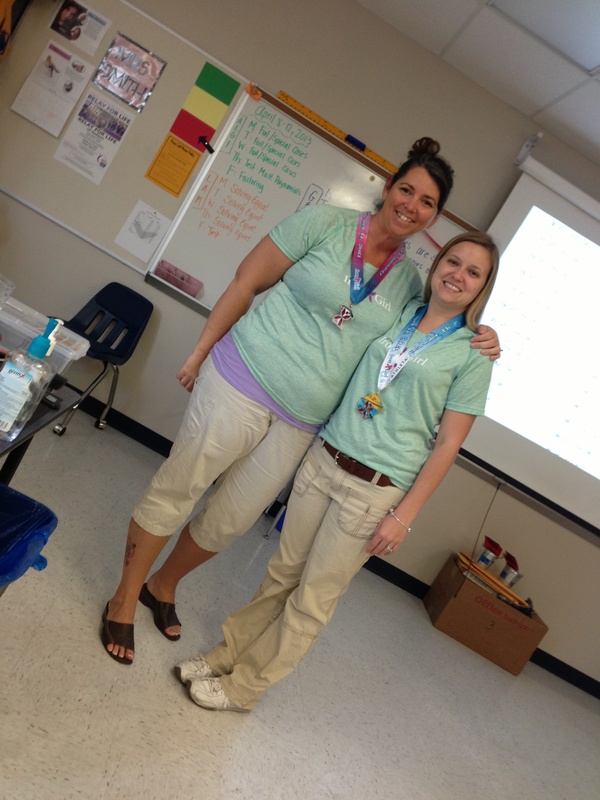 Yes, we wore our Iron Girl shirts and medals all day at school! Hey, it’s teaching our kids to ‘celebrate success’. They love when we share some of our lives with them. They would never admit it, but they do care about us! And Grandma says I am so proud of you and your Mama that I can’t even tell you how proud! All this running is just wonderful. There was a time that I could run 5 miles so I know how good that felt. 13+ miles? Now I can’t imagine that! Three hours?? without sitting down and having a banana popsicle?? No way! I’d need a nap three times in the middle of it!! But like Caitlyn says…pace yourself and like Grandma says “Don’t you dare get hurt! !” Take care and enjoy!! Pingback: Are you an Iron Girl? 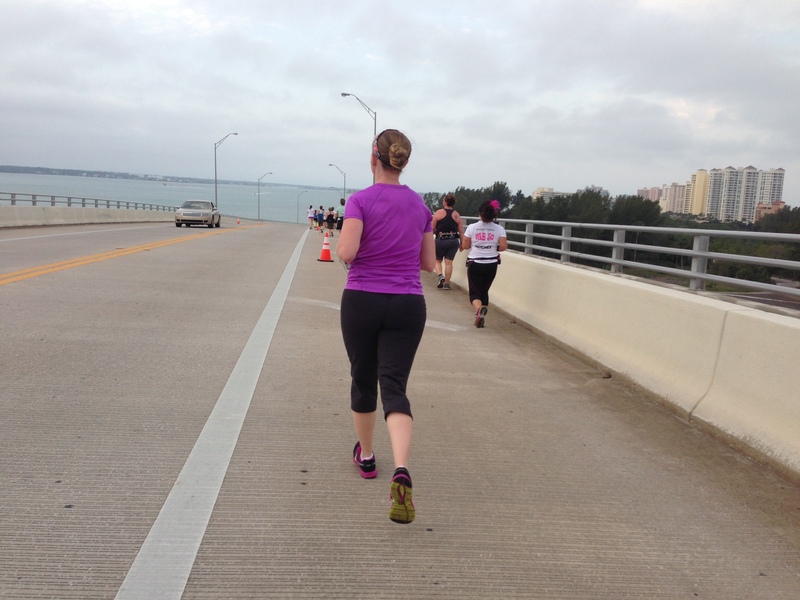 – Discount Code | Tampa Mom Runs!